C'est aujourd'hui mon anniversaire and I was called in to school for a day of relieving French. Dommage! Particularly as it was such a lovely day but there you go: c'est la vie. French in NZ schools is as much palm trees as the Eiffel Tower: New Caledonia and Tahiti are the closest French-speaking countries, and lots of students go there on school trips. Lucky them. I was at university before I got to go to New Caledonia and see real people - even little kids! - speaking French as though it was normal. There are some lovely bits to la Nouvelle-Caledonie, but my money (and you need plenty of that) is on Tahiti for the best French South Pacific experience. Tahiti et Ses Isles, as they say there, and it's the Isles that you want: Tahiti itself is, around the edges anyway, rather messy and unappealing, although the middle is spectacular, with lots of tall green pointy bits. But it's the outer islands of French Polynesia that I like best, and Fakarava, as well as being mildly titillating to say, is a good 'un: huge lagoon in the Tuamoto Archipeligo surrounded by a white foaming reef, an island with classic beachside resorts and lots of little motu, or islets, like this one. It's like a cartoon desert island: tiny, round and empty apart from the tracks of seabirds. The sand really is pink - crushed shell and coral - as well as fine and soft. We got there by buzzing along the lagoon in a flying fish boat, the breeze warm in our faces, past pearl farms where Tahiti's signature green-black pearls are seeded into oysters in little stilted huts over the water. Ah, the water! 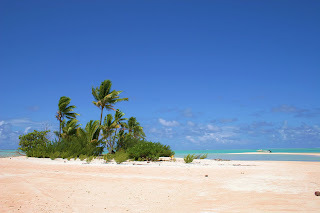 Such a quandary for the travel writer, tropical lagoons: how to avoid the dread word 'azure'? Turquoise, Nile green, aquamarine, cobalt? They all sound like cliches, because they are, because cliches by definition hit the nail right on the head. So to speak. >>> ...I have colour on my mind this morning. I am going on a lagoon cruise and there will be shimmering water in too many shades of blue and green for my vocabulary to cope with, so I have brought reference. I pull the paint charts from my suitcase and stow them in my day bag: the scorned word ‘azure’ will not pass my lips today. The Titi ai Tonga is a traditional-looking boat with carved double prows and a thatched roof, crewed by three young men with a lively line of patter and musical talents too. Captain/Cook steers the boat with his knees and sings as his big fingers pluck the strings of his tiny ukulele; when we reach our lunch-stop he deftly slices up the albacore tuna and bananas, sizzling them on the barbecue as we snorkel gently over the coral.